You can virtually ‘pick your poison’ as you follow the arrows leading to your room of choice. 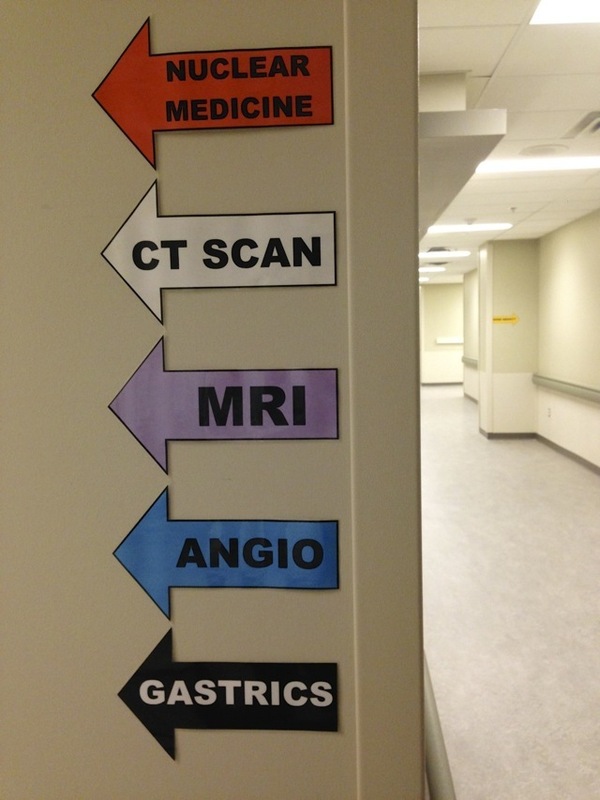 Today was my turn for a CT scan – another interesting ‘first’ in this lifetime, and sadly, it may not be the last. They inserted an IV-lead into my arm, then had me lay down on a table. The table would slowly move through the center of a large, round x-ray machine (all the sides were open). They did this three times, but just prior to the third time they stopped and inject a contrast dye into the lead on my arm. The core of my body felt an instant warmth, and they said it might feel like “I peed my pants”. I was relieved to NOT have this sensation, lol, but did experience the warmth, as well as a disgusting taste in my mouth. I quickly plugged my nose and blew out the nasty air from my mouth! The table passed for a third time through the moving circular camera and that was it. I can only imagine the gross chemicals that are now floating in my body and how long it will take to eliminate them :-(. The good news is that the surgeon called me less than an hour later on my cell phone, to tell me that the scan was negative and there appeared to be no C tumours in other areas of my body other than the ones they were already aware of! He said there were “a couple of tiny soft tissue nodules in my lungs (4-5mm) which were of absolutely no concern and quite common”. Nothing had metastasized. Yay! My husband and I had chosen to go and sit at an outdoor patio to enjoy the warmth and sun of the ‘somewhat still normal day’ before my life really turns upside down, so it sure lightened the air a notch. For a busy brain like mine, it is difficult to slow it down on a ‘normal’ day. Thus, all this extra commotion in my life has certainly made it a challenge. Needless to say I have already lost 6 lbs. just from the stress of it all – and I didn’t really have 6 to lose :-(. I’ve made myself have certain blocks of hours when I block out all thoughts of C. That’s when I get to pretend that maybe this isn’t really happening. Afterwards however, I break out of my bubble to read as much as I can get my hands on – I want to know what to expect, what does what, and everything that I can possibly discover. However, then it all becomes incredibly overwhelming to the point that I feel like I freeze or am drowning. Clearly I have to keep bringing myself back to the ‘here, now, today, this moment’ point in time. Guided meditations are becoming helpful and I’m hoping they lead me finally to unguided ones, so that I can find peace in this swirling head of mine soon. Monday I will go to the C Care Clinic and meet with the Oncologist, who I have a page full of questions for – I’m sure they are used to that. Pre-surgery appointment is Tuesday, then surgery Thursday. Yikes! I wonder when they start to offer you valium? I think I’m going to need it soon! This entry was posted in Uncategorized and tagged breast cancer, CT scan, Denise MacDonald. Bookmark the permalink. You are in our thoughts and we are sending you loving energy from the Fox den. We understand this journey from a little different perspective but it’s all too familiar… although you have lucked out with short wait times after tests. Good for you. Keep up the great work and know you are so loved. Thank you guys. Please feel free to touch base with Kirk or I anytime, we we would love to see/hear from you – we miss you! sending you lots of positive vibes. praying for you. there will be light at the end of the tunnel. at least you had one good news. hugs keep positive .